Can I File a New Jersey Bankruptcy to Get Rid of Business Debt? Are you struggling with business debt that you cannot pay? Do you fear that you are going to lose your business because of a temporary loss of revenue? If so, you may want to consider bankruptcy for small businesses. You may benefit from filing under Chapter 7 or Chapter 13. You may also want to consider filing a New Jersey Chapter 11 bankruptcy case. In this article, our New Jersey business bankruptcy lawyers discuss reasons why you may need to explore filing for bankruptcy relief and the various bankruptcy cases available for businesses. What Are the Signs That Indicate Businesses May Need to File for Bankruptcy Relief? It can be challenging to know when you should file for bankruptcy relief when you own a business. Businesses experience periods of decreased sales. However, does a downturn in business volume automatically necessitate a bankruptcy filing? Filing bankruptcy for small businesses or even a large corporation is an extreme, but necessary, step in some cases. However, because filing bankruptcy is a serious matter with definite consequences, you should consider all available options for business debt relief before filing under any chapter of bankruptcy. NJ business bankruptcy lawyers can help you evaluate your business to determine if filing a bankruptcy case is best for your situation. Let’s look at a few questions that might help you determine if bankruptcy is right for your business. Even though you have cut expenses, are you struggling to pay the bills and business debts? Are you using lines of credit or credit cards to pay utilities, payroll, and other expenses that are typically paid from an operating account? Have you laid off workers or cut working hours to the point at which you are struggling to complete jobs or fill orders? Are you receiving threats of legal action or have you been served with collection lawsuits? Have you started paying your personal bills with a credit card because the business cannot afford to pay you? Are you borrowing money in your name for the business by using a personal guarantee? Are you transferring personal assets to the business? Have you withdrawn personal savings or retirement funds to put into the business? Is the cash flow problem resulting in threats of or actual repossessions of business equipment? Are you struggling to pay business taxes, or do you owe past due business taxes? If you answered “yes” to any of the above questions, you should consider consulting with our New Jersey bankruptcy lawyers. The above situations could be warning signals that your business is in financial trouble. In addition, there could be other warning signs that indicate you need to file a New Jersey Chapter 11 bankruptcy or a bankruptcy case under Chapter 7 or Chapter 13. Deciding which chapter of bankruptcy is best for your situation can be difficult. Let’s review some information for each of the three primary chapters of bankruptcy for small businesses and larger businesses. Chapter 7 cases may be filed by individuals and business entities, such as corporations and partnerships. If you close your business, a Chapter 7 business bankruptcy case may be the best option for your company. When a company files for bankruptcy relief under Chapter 7, all business assets become the property of the bankruptcy estate. A Chapter 7 trustee is assigned by the court to administer the estate. It is the Chapter 7 trustee’s job to liquidate the business property to pay unsecured creditors, such as tax debt, utility bills, credit card debt, and other debt that is not secured by collateral. Some unsecured debts, such as tax debt, receive priority for payment over general unsecured debts. If a creditor holds a lien on property, the property is returned to the creditor. However, if the property has substantial equity in excess of the loan amount, the trustee may liquidate the property, pay the secured creditor in full, and use the remaining funds to pay unsecured creditors. A Chapter 7 trustee may also choose to operate the business for a short time. This situation is not normal, and most businesses shut their doors before filing for Chapter 7 relief. However, continuing operations to pay debts is an option for the Chapter 7 trustee in certain circumstances. Before filing a Chapter 7 business bankruptcy case, you should consult with NJ business bankruptcy lawyers. A business owner who has personally guaranteed business debts are personally liable for the debts if the business does not pay them. Therefore, you could incur substantial personal debt, and your personal assets could be at risk if you guaranteed any of the business debt. A New Jersey bankruptcy lawyer can help you determine the best option to get rid of business debts while protecting your personal assets. A self-employed debtor can file a Chapter 13 business bankruptcy. Business entities, such as corporations and partnerships, cannot file under Chapter 13. 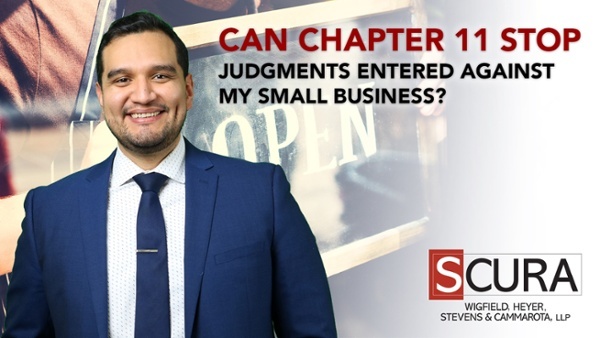 If a business wishes to reorganize and remain open, the company needs to file under Chapter 11, which is discussed in detail below. If you are self-employed and have business debts you cannot pay, you may qualify to file under Chapter 13. A Chapter 13 business bankruptcy case allows you to reorganize your debts, including business debts, into an affordable repayment plan. Each month, you pay a Chapter 13 trustee who uses the money to pay creditors according to the terms of your confirmed Chapter 13 plan. At the end of your Chapter 13 case, any remaining unsecured debts are discharged. Creditors cannot pursue discharged debts once a bankruptcy discharge is granted. However, companies you owe money to for business debts can choose not to do business with you after you file for Chapter 13 relief. Therefore, you may need to find new suppliers if you wish to continue operating your business. Furthermore, you are not permitted to incur new debt without court approval. Therefore, you are not permitted to use credit cards or apply for new lines of credit for your business while you are in a Chapter 13 case. Most Chapter 13 business cases involve sole proprietors who can continue to operate their business without incurring new debts or searching for suppliers. For larger companies, partnerships, and corporations, a New Jersey Chapter 11 bankruptcy case is probably the best option when you cannot pay business debts. A New Jersey Chapter 11 bankruptcy case allows a corporation or partnership to reorganize its debts to continue doing business. In some cases, a Chapter 11 case may be filed by individuals who have liabilities that exceed the maximum debts for a Chapter 13 case. When a business files under Chapter 11, the business is considered a debtor-in-possession (DIP). Unlike a Chapter 7 business bankruptcy, the DIP retains control of all business assets because the company continues to operate even though the bankruptcy laws protect the company from specific actions by its creditors. During the Chapter 11 case, the business works with its creditors to restructure business debt so that it can pay its business debt while it continues to conduct business as usual. Creditors are prohibited from suing the company or seizing assets during the Chapter 11 case without court approval. However, the company may not take certain financial steps without court approval until the case is completed. In addition to the Chapter 11 bankruptcy petition and schedules, a company that files a New Jersey Chapter 11 bankruptcy case is also required to submit a Disclosure Statement and a Plan of Reorganization. The Disclosure Statement provides creditors and other parties in interest a summary of the company’s history, financial standing, and operations. It is a “sales pitch” to convince creditors to vote in favor of the company’s Plan of Reorganization. The Plan of Reorganization outlines how the company intends to reorganize its business debt. Creditors are given priority within the plan based upon their status as a secured creditor, priority unsecured creditor, or general unsecured creditor. Some creditors may receive full payment of business debts, but other creditors may receive a certain percentage of the debts owed by the company. In some cases, a company may surrender the collateral to a secured creditor or negotiate new terms for a loan agreement. Obtaining approval from the court and your creditors for a New Jersey Chapter 11 bankruptcy plan may involve intense negotiations. However, once the Chapter 11 Plan of Reorganization is confirmed, the business may continue operations without obtaining court approval for financial decisions. A confirmed Chapter 11 plan replaces pre-bankruptcy contracts with creditors by creating new contractual rights. The business must make all payments required by the confirmed plan and abide by the terms of the plan. Hiring an experienced New Jersey business bankruptcy lawyer is strongly advised if you believe you need to file a New Jersey Chapter 11 bankruptcy case. A bankruptcy case under Chapter 11 involves complex legal matters that are specific to cases filed under this chapter of bankruptcy. In addition to the complexity of the Disclosure Statement and a Chapter 11 Plan of Reorganization, DIPs are required to submit monthly operating reports until the case is closed. Furthermore, Chapter 11 cases often involve creditor’s committees, examiners, avoidable transfers, cash collateral motions, adequate protection motions, securing operating capital, motions to modify the automatic stay, and, adversary proceedings. Working with experienced New Jersey business bankruptcy lawyers can increase the chance of successfully completing a Chapter 11 business bankruptcy case. What is the Bankruptcy Process and Timeline for Businesses? In all bankruptcy chapters, a business must begin by filing a bankruptcy petition and schedules. The bankruptcy schedules provide details about the company’s assets, debts, income, expenses, ownership, and financial transactions. Each debtor is required to attend the First Meeting of Creditors (also referred to as a 341 Meeting). Creditors may appear to ask questions. In addition, the trustee assigned to the case or the U.S. Trustee’s Office asks questions. All answers are provided by the debtor who is under oath. In a Chapter 7 business bankruptcy case, the debtor may not have too much to do after the case is filed because the Chapter 7 trustee assumes control of the business. The trustee’s decision whether to liquidate assets often determines the length of the case. If the Chapter 7 trustee determines that the case is a no-asset case, the NJ business bankruptcy case may close within several months after the first hearing. However, a business Chapter 7 case that involves liquidation of assets could take a year or more to complete. Chapter 13 business cases typically take a little over five years to complete. The term for most Chapter 13 plans is 60 months. However, some debtors may qualify to file a 36-month plan, but this is not typical. Once a debtor completes the plan payments and the Chapter 13 trustee completes his or her final accounting, the case may be closed. A New Jersey Chapter 11 bankruptcy case is much more complex compared to cases filed under Chapter 7 or Chapter 13. The length of time it takes to complete a Chapter 11 case depends on numerous factors. However, a Chapter 11 case could be completed and confirmed within a year, especially in smaller business bankruptcy cases. The length of a Chapter 11 plan depends on the terms negotiated with creditors. The plan creates a contractual agreement with creditors. Therefore, the “plan” is as long as necessary to complete all payments to all creditors. What Happens After a Business Files for Bankruptcy? Immediately upon filing a business bankruptcy case, the debtor’s assets are protected by the automatic stay. The automatic stay prevents creditors from seizing assets or taking any actions to collect debts without court approval. The purpose of the automatic stay is to prevent creditors from seizing assets that could be used to repay debts. In Chapter 13 and Chapter 11 cases, another objective of the automatic stay is to allow the debtor sufficient time to propose and confirm a plan of reorganization. As discussed in detail above, the chapter of bankruptcy being filed by the company dictates the sequence of events that follow filing the bankruptcy petition. The process for completing a bankruptcy for small businesses is different from a New Jersey Chapter 11 bankruptcy case for a large corporation. Our NJ business bankruptcy lawyers guide clients through the bankruptcy process. If you are struggling to pay business debt, we encourage you to meet with a bankruptcy attorney to discuss your options for filing a business bankruptcy petition. You may find that a New Jersey business bankruptcy case is an affordable, practical way of saving your company.